All you need is a location and A Party Center can even supply the bathroom. We can accommodate every size event with the perfect equipment to meet your needs from the basic to the extravagant. 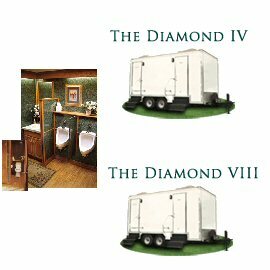 Our Diamond Series provides the most prestigious level of comfort available. All the coaches in our Diamond Series are enhanced with simulated marble walls and wood laminated floors with area rugs. Each coach is outfitted with porcelain sinks and wood doors. In addition, they have large lighted vanity areas, heating and air conditioning, hot and cold running water, a stereo sound system, skylights, liquid hand soap and hand towels. The Sapphire Series is sure to please. 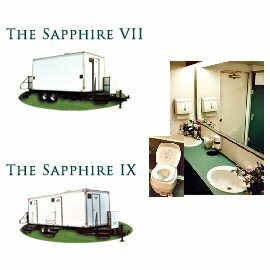 The Sapphire Coach is equipped with air conditioning and heat, hand soap and hand towels, waste-baskets, hot and cold running water, baby changing station, indirect lighting, roof vents, and exterior lighting. Although the Sapphire Series does not have the luxurious feel of the Diamond Series, their clean lines and functionality are crowd pleasers. 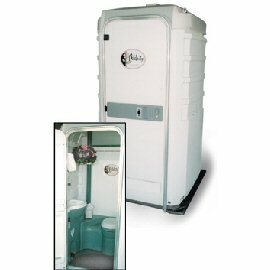 The Pearl Series is designed to provide comfort to your guests at an excellent value. Pearl Coaches are an industry standard and will provide your guests with a comfortable level of service to accommodate all their sanitation needs. Some of the amenities included in our Pearl Coaches are air conditioning, sinks with running water, liquid soap, hand towels, wall-mounted mirrors, and coat hooks. 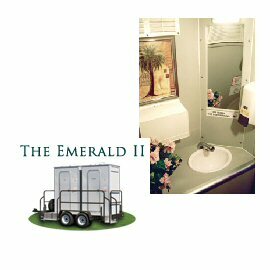 Although our Emerald Coach is not your typical restroom trailer, you and your guests will be pleasantly surprised with the interior of this gem. Each Emerald Coach is equipped with two private restrooms, which both operate on solar power. Both units are equipped with lighting, flushing toilets, and sinks with running water. The Emerald Coaches are also equipped with air conditioning and heat where electricity is available. The Emerald is an excellent value! The Most distinguished Powder Room Anywhere. ideal for weddings, formal events, private parties, golf courses, and marinas. Planning for a public event or a construction project requires smart decisions on a host of problems. 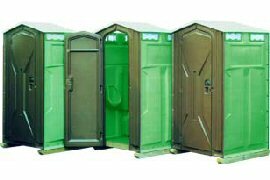 We use precise charts to determine the correct number of toilets you'll need based on the number of people and time frame. 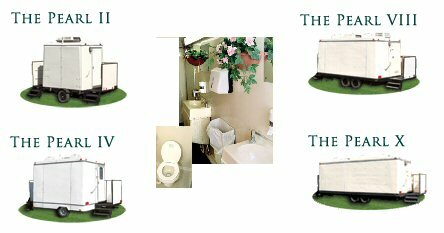 We'll also help you with proper toilet placement on your site. Allow A Party Centers quaility equipment and knowledgeable staff help you with all of your event needs. Entertain in grand style under impressive tents of all sizes. Tents can be in your warehouse, parking lot, or on your lawn any time of the year complete with heating, lighting, fans, flooring and more. Make your next event or meeting more successful, memorable and convenient with to-scale computer floor planning and experienced assistance from our representatives.